This guideline sets out an antimicrobial prescribing strategy for acute sinusitis. It aims to limit antibiotic use and reduce antimicrobial resistance. Acute sinusitis is usually caused by a virus, lasts for about 2 to 3 weeks, and most people get better without antibiotics. Withholding antibiotics rarely leads to complications. See a 2-page visual summary of the recommendations, including tables to support prescribing decisions. 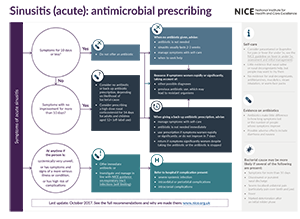 NICE has also produced a guideline on antimicrobial stewardship: systems and processes for effective antimicrobial medicine use. We checked this guideline in April 2019 to assess the impact of the 2018 English Surveillance Programme for Antimicrobial Utilisation and Resistance (ESPAUR) report. We found no new evidence that affects the recommendations in this guideline. NICE worked with Public Health England to develop this guidance.